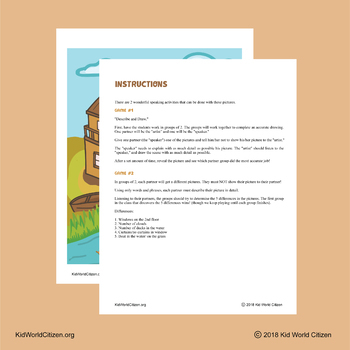 These 2 speaking activities can be used in ANY target language!! Do you want your students to SPEAK naturally, with a purpose? These speaking games help create a favorable environment with the engaging tasks that get students excited to say something at the level they are. Real communication comes when we give students meaningful tasks, real-life communication, and authentic activities that promote oral language. 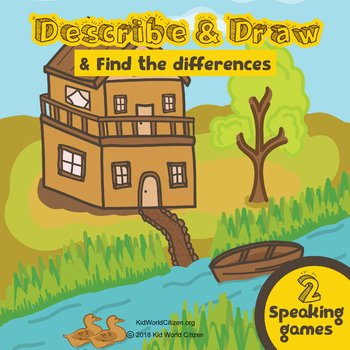 "Describe and Draw" is a fun speaking game that helps kids communicate and give directions and detailed descriptions while their partner draws it out. Working in partners, students decide who will be the one speaking, and who will be the artist. We have used a simple drawing, with common vocabulary. It is helpful if students are familiar with prepositions such as on the left/right, in front of, behind. 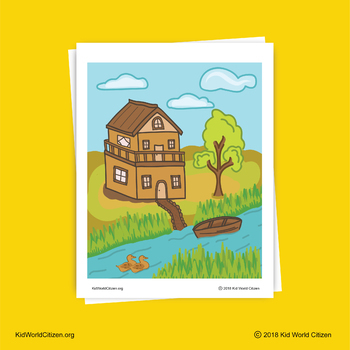 Other useful vocabulary: numbers, shapes, and words such as house and tree. You can turn this into a game by examining all of the partner-made drawings and deciding who has the most accurate scene! "Find the Differences" is another very fun communicative speaking activity. Students work in pairs, and each have a different (but similar) picture that they must keep hidden from their partner. Students should work together speaking in the target language about and describing their photo to try and determine the 5 differences between the scenes (for example, in one the boat is in the water, in the other it is out of the water). The students can race against the other groups in class to see who can find the 5 differences first! This is so fun, my kids ask me to find more examples of this game. Similar vocabulary is needed for this game.